In order to learn more about national and international politics and to strengthen their insights of the Republic of Korea, the delegates of “NMUN Westfälische Hochschule” were spending the days from 21st to 24th of February in Berlin. The delegates were kindly invited to several constitutions where their representatives were focusing on their questions about national and international affairs in today’s politics while highlighting particularly the Republic of Korea. At the “Willy Brandt Saal” at the Ministry of Foreign Affairs in Berlin, Mr. Jan Janowski, head of the language service department in the German embassy in Pjönjang, was holding an absorbing lecture about the Korean opinion, speaking about gender equality, smart cities, environmental protection and nuclear technology. The difficult relation to Koreas neighboring states was mentioned, as well the consequent amount of displaced people living in The Republic of Korea. The “Deutsch-Koreanische Gesellschaft” is located at the Korean embassy in Berlin. Mrs. Gunderlach and Dr. Kwon, head of the cultural centre, gave an insight lecture on the life of Koreans. In a very attractive discourse, the main topics were set to family life, refugees, nuclear energy and the job situation. Matthias Martin, specialist for foreign and safety politics, received the delegates to explore the significance of international relations regarding the Asian continent and especially focusing on The Republic of Korea. 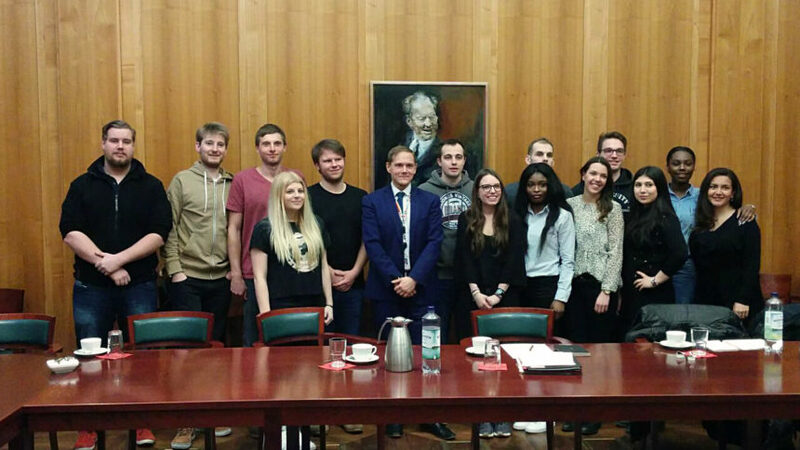 A former citizen of Recklinghausen, where the Westfälische Hochschule is located, was welcoming the delegation at the Bundestag. Frank Schwabe is a german politician (SPD) and member of the German Parliament. Mr. Schwabe told the delegation about his efforts fighting against human rights violations. After these informative days, the delegates took the opportunity to visit the museum “The Story of Berlin” to explore the history of the German capital. Before heading to the “German Model United Nations” in Straußberg, the delegation enjoyed Korean dinner in Berlin.